In this guide, I will show you some useful tips for importing Sony PMW-F55/F5 4K Digital Camera XAVC Footages to iMovie/FCE for smoothly editing. Sony has announced that cameras that will support XAVC include two CineAlta cameras which are the Sony PMW-F55 and Sony PMW-F5. Both cameras record XAVC with a color depth of 10-bits and 4:2:2 chroma subsampling. The Sony PMW-F55 can record XAVC with 4K resolution at 30 fps at 300 Mbit/s and 2K resolution at 30 fps at 100 Mbit/s. The Sony PMW-F5 can record XAVC with 2K resolution at 30 fps at 100 Mbits/s. XAVC can record 4K resolution at 60 fps with 4:2:2 chroma subsampling at 600 Mbit/s.A 128 Gigabyte SxS PRO+ media card can record up to 20 minutes of 4K resolution XAVC video at 60 fps, up to 40 minutes of 4K resolution XAVC video at 30 fps, and up to 120 minutes of 2K resolution XAVC video at 30 fps. As the lasted HD recording formats introduced by Sony, XAVC format is seldom used now, when you are planning to conduct post production to the PMW-F55 (or PMW-F5) XAVC footages with your Mac editor like iMovie and FCE, you may encounter with the problem like "the file cannot be imported/opened". How to make Sony F55/F5 4K XAVC Video editable in iMovie and FCE? Install and launch Pavtube HD Video Converter for Mac, and click "Add File" to import your Sony PMW-F5/F55 XAVC files; or click "Add from folder" to load videos in batch. This is a powerful XAVC video converting software which can not only easily convert XAVC footages to FCE/iMovie preferred formats smoothly, but also import Sony PMW XAVC into FCP without any problem. Step 2. Choose AIC codec for iMovie and Final Cut Express. Choose output video format from the 'Format' preset, and click 'Output' to change converted video path. Then pls click iMovie and FCE>Apple InterMediate Codec(AIC)(*.mov) to get Sony XAVC to FCE/iMovie preferred codec. If you want to locate your videos quickly, click Browse. The "Settings" icon will meet your requirements of adjusting video bitrate, frame rate and so on. To get 1080 videos, we need to click the "Settings" button and choose 1920*1080 as output video resolution. Moreover, you can edit your Sony XAVC videos before converting. By clicking the pencil icon on the top of Mac XAVC Video Converter, you can trim/crop the video clips, add or adjust video effect, or take snapshots from video as you like. Step 3. 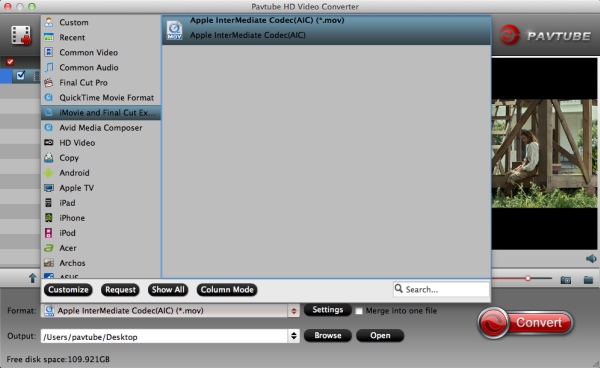 Start converting Sony XAVC to AIC MOV for iMovie/FCE. Click the big red circle to convert Sony PMW-F5/F55 XAVC videos to iMovie/FCE on Mac. After conversion finished, you then are able to edit or share your XAVC HD videos on the go.